The former Wall Street darling posts its results on Thursday, Feb. 2. This past year has been easily the most challenging period for Chipotle (NYSE:CMG) since it went public in 2006. Twelve months ago, the damage from the restaurant chain's food-safety scare peaked at a 34% dive in customer traffic. A year later, sales growth appears to be returning, but Chipotle's business still faces huge challenges in its bid to climb back to anything approaching its prior glory days. Let's look at the key trends to watch for as the casual dining expert posts earnings results on Thursday. Investors already have a good idea of what kind of sales growth to expect since the company pre-announced a few tantalizing fourth-quarter details in early January. Comparable-store sales likely fell by 5%, which would mark a huge improvement over the prior quarter's 15% slump. Better still, the trend improved through the quarter, and even broke into positive territory. Comps fell 20% in October, management said, dropped 1% in November, and then jumped 15% in December. Of course, December was about the easiest possible month for Chipotle to show year-over-year growth since customers were avoiding its locations in the year-ago period as negative publicity peaked surrounding E. coli outbreaks. Management will be tempted to call the latest growth gains a rebound, and the comparisons stay easy over the next year given that Chipotle suffered 20% or worse comps declines in each month of 2016. However, investors should be focused on when, if ever, the company can recover its lost ground. Average restaurant sales touched $2.5 million in the quarter immediately preceding its food safety scare, but the figure was below $2 million at its last quarterly check-in in late October. Until recently, when Chipotle talked about customer service, it was to trumpet its market-leading scores and industry-thumping levels of repeat business. That hasn't been the case lately, though. Executives recently revealed that half of the chain's restaurants carried a "C" rating or below in Chipotle's internal satisfaction-tracking polls. As focus turned to food safety, the company dropped the ball on some of the basics around the shopper experience such as wiping down tables and speeding customers through the check-out line. "When we invite customers into restaurants that are less than perfect, they will not return as frequently," Ells told investors in a December presentation. In response, the company shook up its management structure and promised to refocus on improving the shopper experience. Investors should hear plenty about its progress on this initiative on Thursday. Chipotle will post restaurant-level operating margin of only about 14% this week, according to management's latest projection. Declining guest traffic pinched that result, as did increased spending on promotions and TV advertising aimed at convincing former customers to return to their old burrito-bowl habits. Earnings will also take a hit from higher food costs. CMG Operating Margin (TTM) data by YCharts. These negative trends likely combined to push operating income down to just one third of the prior-year's result, which shows just how far Chipotle must climb before it can reach the near-30% restaurant operating margins it enjoyed just before its crisis hit. The company has no shortage of important spending priorities ahead, including a huge new one tied to food safety. Chipotle may also need to boost wages, given that it's now asking employees to spend a chunk of their time following some of the industry's strictest food-handling procedures. Meanwhile, these team members are asked to stay engaged enough in customer service to make the stores more enjoyable places to eat than they have been recently. 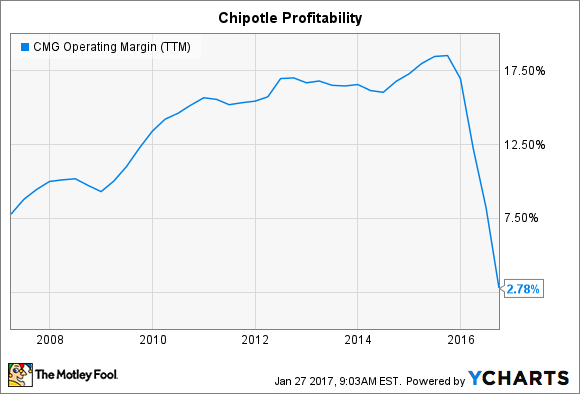 Without solidly profitable existing locations, it's possible Chipotle may need to consider scaling back on its store growth plans, which could make 2017 another difficult year for the business.